The expectations were high when waking up with sunny skies this morning. After a cool night, the warm temperatures started heating up quick and everything looked promising for the thermic winds to kick in early afternoon. Therefore the first tow-in qualification for heat B was started right after skippers meeting around 11.30h to make use of the calm water conditions before the wind increases. 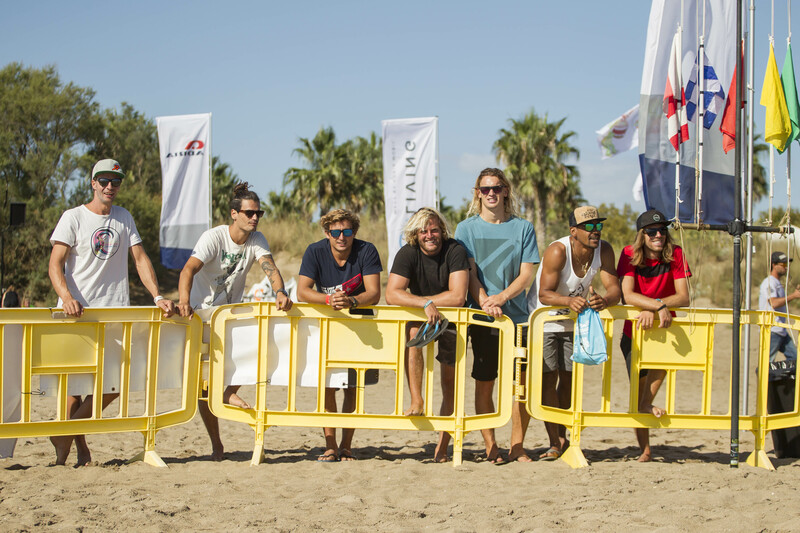 Up in this tow-in heat were Steven van Broeckhoven (JP/Gun Sails), Mattia Fabrizi (Patrik), Francesco Cappuzzo (RRD/RRD), Tonky Frans (RRD/RRD), Loick Spicher (RRD/RRD) and Giovanni Passani. With light cross-offshore direction, the water remained flat and provided ideal tow-in conditions. Every rider was given 3 runs and after the first attempts everybody was getting in the rythm, so that on the their third run the top scores started to pop up. Tonky Frans, who already went big on a crashed Double Air Culo, landed a clean Culo 360 just a few meters from the crowd cheering at the beach and got rewarded 8,00 points for that. Fellow RRD teamrider Francesco Cappuzzo stomped a powerful Culo into Spock earning him 8,38 points. But it was Steven Van Broeckhoven who got scored the highest, a 8,75 for a perfectly executed Air Funnel into one handed Burner clean with two high pops. Surprisingly after this tow-in session instead of the wind swinging to southeast direction, it kept blowing from the north even increasing slightly and therefore working against the thermic winds. 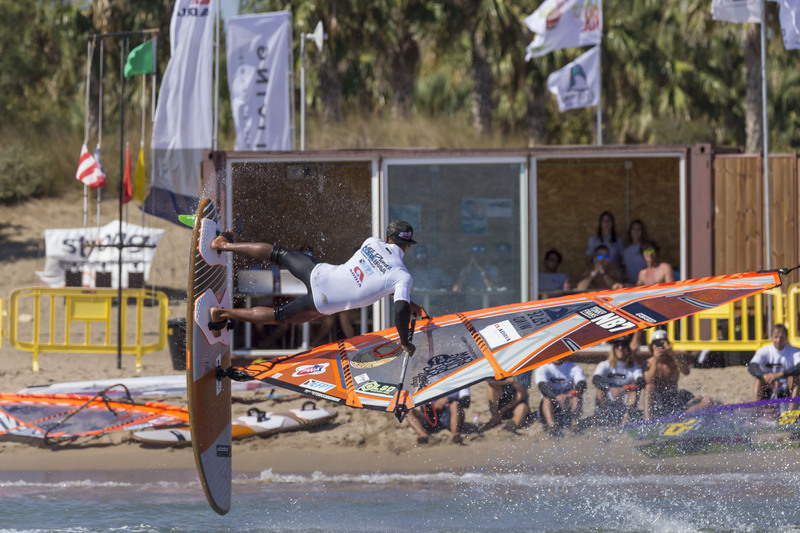 The freestyle competition remained on announcements during all afternoon and when the clouds started to cover the sky again, the wind direction finally switched to southeast around 15.00h, but did not gain enough strength anymore in the late afternoon hours. 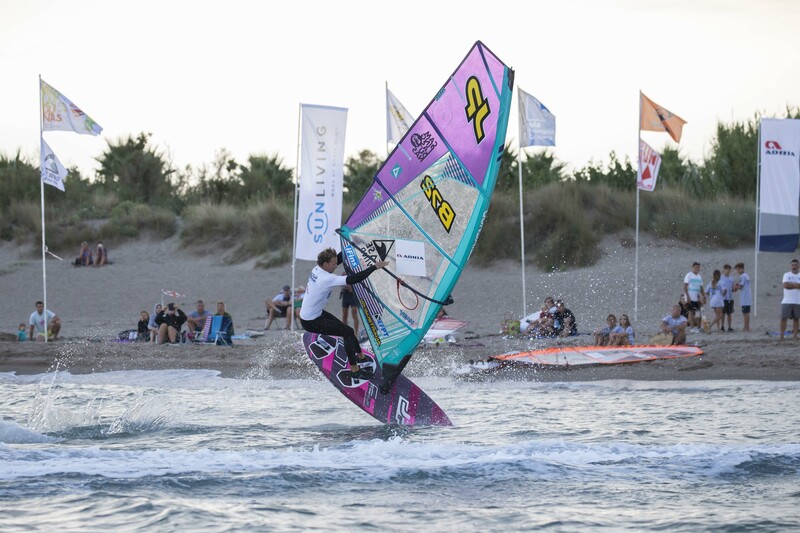 With no more chance of freestyle windsurfing conditions, the decision was made to run the rest of the tow-in qualification heats during an evening session to determine the 6 finalists for the weekend. Everybody had another 3 attempts behind the jetski and the best 2 moves out of the total 6 from each rider were counting. First up was qualification heat A again where Adam Sims (Patrik/Sailloft) strengthened his lead by busting out a stylish no-handed Burner. 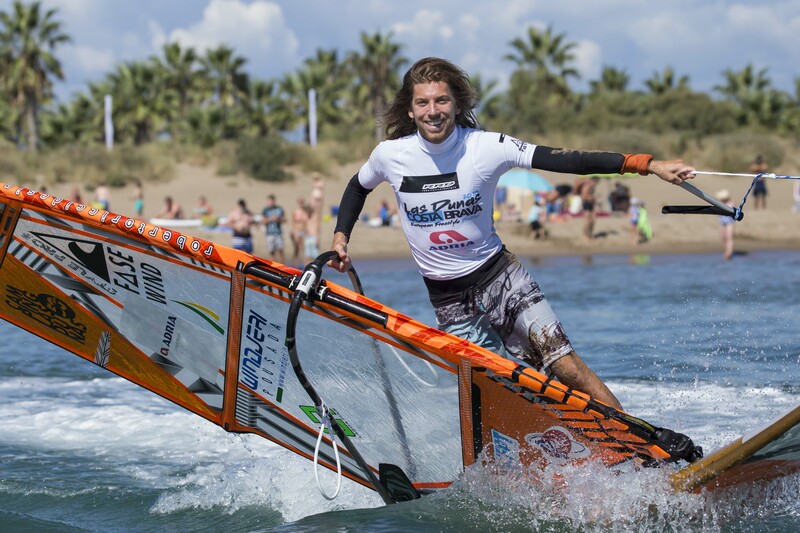 Also the other two qualifying positions were kept by Riccardo Marca (Fanatic/Duotone) landing a clean Culo and Antoine Albert (Goya/Goya) added a Burner 360 as his second counting move. Right after heat A, the riders of heat B were sent on the water for their second tow-in session of the day. Steven Van Broeckhoven was sitting in a comfortable lead after his high scoring move from the morning and was eager to land some different tricks. His plan worked out well, cause a rarely seen move, the Barracuda (Willy Skipper Chachoo), earned him another solid score and secured his place in the final. The other 2 riders of the heat that will join Steven in the final are both Italians. Mattia Fabrizi and Francesco Cappuzzo both added good scores for their clean executed moves over Tonky Frans who could not find a second solid backup score. With tomorrows forecast saying southeast wind direction already earlier in the day, the thermic effect should enforce that and provide the needed winds to finally run the single elimination. Skippersmeeting is set for 10.30h with the first possible start at 11.00h. Action from the final rounds of high-powered tow-in qualification. Adam Sims leads the way as we head into the finals tomorrow morning. Forecast looks promising for official competition to resume later in the day.